In 2017, the population of DCSDC was estimated at 150,500. 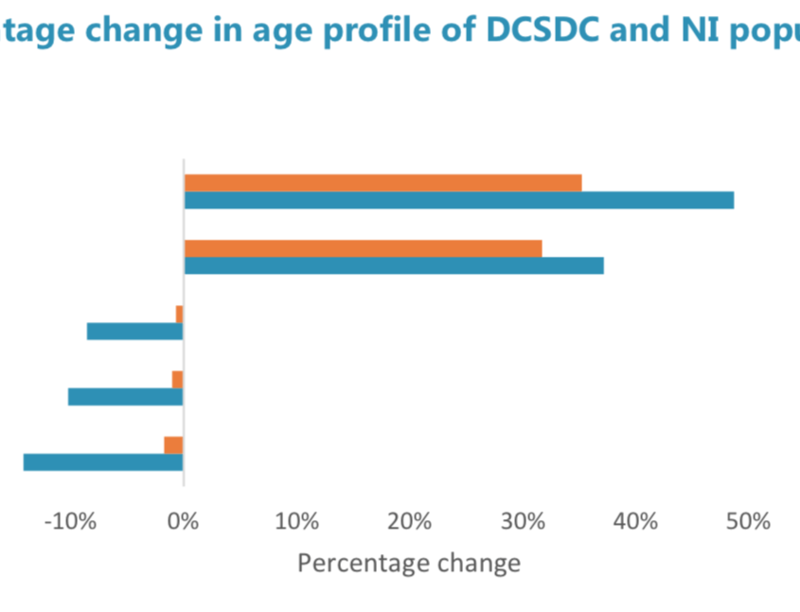 The age profile of the population of DCSDC is currently slightly younger than that of NI as a whole. 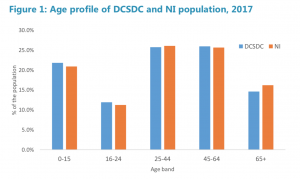 21.8% of the population within DCSDC are aged under 16 compared with20.9% in NI. DCSDC has a lower proportion of residents at retirement age, with 14.6% aged65 and over compared with 16.2% in NI. The population of DCSDC increased by 6,690 (4.6%) between 2001 and 2017. This increase in population is primarily due to the age profile of DCSDC getting older. Between 2001 and 2017 the number of children aged 15 and under has decreased by 5,420 (-14.2%). Accompanying the decrease in the number of children has been a rise in the number of residents aged between 45 and 64 as well as an increase in the number of residents aged 65 and over. The number of citizens aged between 45 and 64 has increased by 10,580 (37.1%) whilst the number of residents aged 65 and over has increased by 7,200 (48.7%). 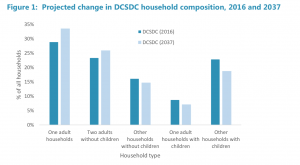 In 2016, the latest household projections estimated that ‘One adult’ households made up the largest type of household within DCSDC (16,600 households or 28.9%). This rate was similar to NI as a whole (28.0%). Households with children are estimated at 18,100 of all households here, equating to 31.6% of all households (29.6% for NI). By 2037, the number of ‘One adult’ households is expected to increase by 3,800 bringing the projected total to 20,300 or 33.5% of all households. This would be a higher rate than that projected for NI (29.6%). 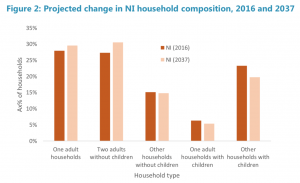 Conversely, by 2037, the number of households with children is projected to fall by 2,500 to 15,700 households or 25.9% of all households (25.1% for NI). In 2018, the housing stock in DCSDC was 61,736. This is an increase of 3.9% from 2013 (59,443). Terraced houses have made up approximately 35% of the domestic properties in DCSDC between 2013 and 2018. 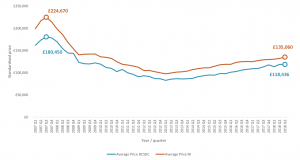 Detached properties have made up approximately 30% of the domestic properties in DCSDC between 2013 and 2018. In March 2018, there were 4,447 applicants recorded on the social rented sector waiting list. 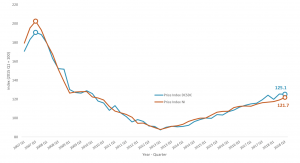 The standardised residential property price for DCSDC fell to £82,705 in quarter 1 of 2013. It stood at £118,436 in quarter 3 of 2018. In 2017, the Labour Force Survey estimated that there were 54,000 people in employment within DCSDC. Of these, 40,000 were in full-time employment and 13,000 were in part-time employment. This led to an employment rate, for those aged 16 and over, of 48.2%. The employment rate for those of working-age, i.e. 16-64, stood at 56.8%. Both the 16+ and 16-64 employment rates for DCSDC have been consistently below the NI average since 2009. Employee jobs refer to the number of employee jobs within businesses that have either a VAT or PAYE registration. They mainly differ from overall employment figures in that they exclude most agricultural businesses and the self- employed. 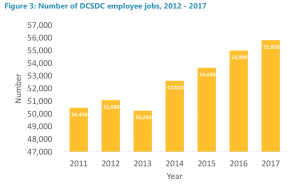 In 2017, there were 55,820 employee jobs in DCSDC. Of these, 25,750 were jobs carried out by males and 30,070 were jobs held by females. Males have a higher tendency to work in full-time positions. Of the 25,750 jobs held by males, 20,210 jobs (78.5%) were full-time and 5,530 were part- time. The split in job status for females was more even with 15,510 jobs (51.6%) being held by a female in a full-time position and 14,560 (48.4%) being held by a female in a part-time position. In 2017, DCSDC had a lower proportion of employee jobs held by males (46.1%) compared with NI (48.4%). In turn a higher proportion of employee jobs in DCSDC were held by females (53.9%) compared to NI (51.6%). DCSDC had a lower proportion of full-time jobs (64.0%) compared to NI (65.4%). 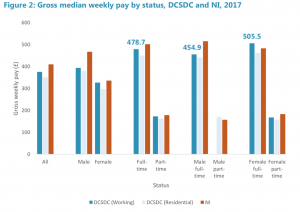 For both DCSDC (78.5%) and NI (80.8%), a higher proportion of males tended worked in full-time positions, whereas the proportion of females, working in full-time posts, was 51.6% in DCSDC and 50.9% in NI. The industry with the greatest amount of employee jobs located within DCSDC is the ‘Human Health and Social Work’ sector with 11,310 employees in 2017 (20.3%). There are 9,530 employees (17.1%) within the ‘Wholesale and Retail Trade; Repair Of Motor Vehicles and Motorcycles’ sector making it the second largest sector within DCSDC. 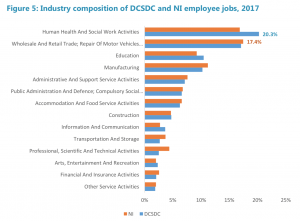 When compared to NI, a higher proportion of DCSDC employee jobs are concentrated in those sectors with high Public Sector involvement. This is due to the presence of a major hospital, university campus and regional technical college all in the Council area. As a result, nearly a third of employee jobs (30.8%) are in the ‘Human Health and Social work’ industry (20.3%) and the ‘Education’ industry (10.5%). In NI, just over a quarter (26.1%) of employee jobs are in the same industries. Across NI, the agricultural labour force has sthbilized in the last number of years from a historic long-term downward trend in it is size. It is believed that this stabilisation in numbers is not necessarily due to an increase demand for farm labour but more to difficulties in farm family members securing off- farm employment and to changes in Common Agricultural Policy support arrangements that link subsidies to some level of active farming. As stated earlier, the annual surveys that record the number of employee jobs do not record the number of self-employed. Therefore the analysis, presented below, is taken from the Economic Briefing, NISRA. 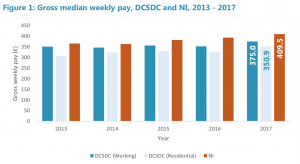 In 2017, the gross weekly median pay for those working in DCSDC was £375.0 compared with a figure of £350.9 for those who live in the council area. Both of these were lower than the overall NI average (£409.5). Those working in DCSDC tend to earn more than those who live in DCSDC. This is as a result of a greater tendency of workers to commute into the council area for higher earning employment. The claimant count is an administrative data source derived from Jobs and Benefits Offices systems, which records the number of people claiming unemployment- related benefits. From 21st March 2018 NISRA changed the claimant count measure from one based solely on Jobseekers Allowance to an experimental measure based on Jobseeker’s Allowance claimants plus out-of-work Universal Credit claimants who were claiming principally for the reason of being unemployed. The definition of out-of-work Universal Credit Claimants is close to but not exactly the same as Jobseekers Allowance claimants. The GB and NI Claimant counts are now calculated on an equivalent basis. 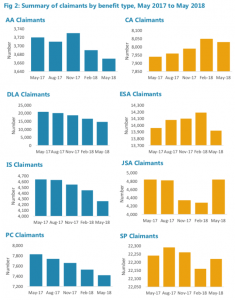 As Universal Credit Full Service is rolled out in particular areas, the number of people recorded as being on the Claimant Count is therefore likely to rise. 1 Large revisions are to be expected while the series is experimental and improvements are being made to the process. In October 2018, the unadjusted claimant count rate for DCSDC was 4.9% compared with a rate of 2.5% for NI. Within DCSDC this equated to a total of 4,735 claimants, of which 2,970 were male and 1,765 were female. The DCSDC claimant count rate for males was 6.3% (3.1% NI) and for females it stood at 3.6% (1.8% NI). The DCSDC and NI unadjusted claimant count rates have reported a downward trend since 2013. Before the onset of the 2007 recession, the unadjusted claimant count in DCSDC stood at 3.8% (2.0% in NI). The unadjusted claimant count in DCSDC peaked at 8.7% compared with a peak of 5.7% in NI. Within the DCSDC area, at October 2018, 81% of JSA claimants had been claiming for a year or more. This compared to a rate of 50% for NI as a whole. Both DCSDC (14%) and NI (17%) had similar rates of young people on the claiming JSA. However, DCSDC (77%) has a higher proportion of young people claiming for a year or more compared to NI (34%).  In 2017, there were 4,945 businesses, registered for VAT and/or PAYE, operating within the DCSDC area. This made up 6.9% of all such businesses within NI.  In line with the trend experienced across NI, the number of VAT and/or PAYE registered businesses within DCSDC has shown an upward trend from 2015. 1 In 2016 an exercise was carried out by NISRA to allocate those businesses with inaccurate or missing postcode data to the appropriate Council area. This has been applied to data from 2015 onwards. The number of businesses in operating within DCSDC increased by 315 from 2015 to 2017, an increase of 6.8%. Within NI, the number of businesses increased by 5.2% over the same period.  Both DCSDC and NI have similar proportions of their business within those size bands employing less than 10 people (88.2% and 88.0% respectively).  Similarly, both DCSDC and NI have similar proportions of their business within those size bands where turnover was less than £100,000 (45.8% and 45.4% respectively).  The largest industry group in DCSDC and NI is Agriculture, Forestry and Fishing, accounting for over one quarter (24.6% and 24.9% respectively) of all VAT and/or PAYE registered businesses.  Outside of Agriculture, the largest industry group in DCSDC is Construction (15.1%) and then Retail (9.5%).  DCSDC has a higher proportion of its industry in these three groups compared to NI. DCSDC also has a higher reliance on the Health Industry.  However, it then has a lower dependence on those industries allied to professional services (IT, Professional /Scientific, Business support).  In 2017, there were a total of 1,773 farm businesses in DCSDC. compared to 69.3% of all farms in NI. falling into this category compared with 6.9% in NI. 2 Farm business size is determined by calculating each farm’s total Standard Labour Requirement (SLR). Large farms require 3 or more SLR. At basic prices of the non-financial business economy, excluding farming and financial services. In 2015, the income generated by businesses in DCSDC, less the cost of goods and services used to create this income was estimated to be £1,234.7 million. This amount represents the approximate Gross Value Added (aGVA) at basic prices of the NI non-financial business economy, excluding farming and financial services. Estimates from the 2017 Labour Force Survey (LFS) indicate that 46.6% (52,000 people) of all those aged 16 and over, in DCSDC, were economically inactive, i.e. people who are neither in employment nor unemployed as per the International Labour Organisation (ILO) measure. This was higher than the rate for NI (40.3%). The 16-64 rate of inactivity was somewhat lower as it does not include the majority of those who are retired. This rate of inactivity stood at 37.0% (34,000 people) within DCSDC compared with an NI average of 27.7%. The LFS does not allow for an examination of the reasons of economic inactivity within council areas due to the sampling robustness of local estimates. Table 2 previously has, however, provided a breakdown of the reason for economic inactivity as recorded in the 2011 Census of Population. In 2011, 32.9 % of those aged 16-64 were economically inactive due to ‘long-term sickness or disabled’. 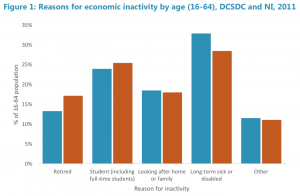 Nearly a quarter (23.9%) of those aged 16-64 within DCSDC were inactive as they were students. Rates of inactivity due to ‘long-term sick or disabled’ increased with age. Rates of inactivity due to ‘looking after family / home’ were most prevalent for those aged 25-44 (35.8%). 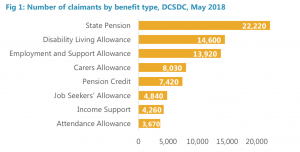 In May 2018, there were 14,600 claimants of Disability Living Allowance in DCSDC. This total decreased by 6,300 (30%) over the year. This fall is due to the introduction of Personal Independence Payment (PIP) on 20th June 2016. With the introduction of Personal Independence Payment (PIP), there have been no new working age claimants to DLA. The main reassessment of existing DLA claimants to PIP commenced in December 2016 and is expected to end in April 2019. • At May 2018, there were 8,730 PIP claims in payment within the DCSDC region. This accounted for 11% of all PIP claims in payment within NI (76,920). 1. Figures for children in pre-school settings relate to children in funded places. 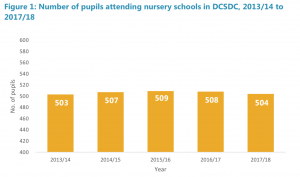 The number of pupils attending nursery schools within DCSDC in 2017/18 was 504. 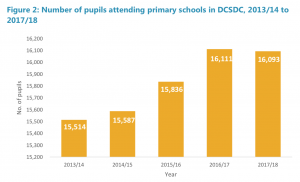 The overall number of pupils enrolled in primary schools in DCSDC has increased gradually from a total of 15,514 in 2013/14 to 16,093 in 2017/18. 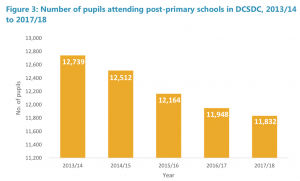 There was a steady decrease in the number of pupils attending post-primary schools, within DCSDC, in the five year period 2013/14 to 2017/18. 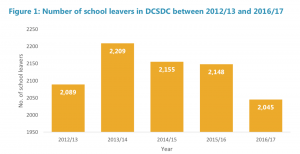 In 2012/13 there were 2,089 school leavers compared to 2,209 school leavers in 2013/14. 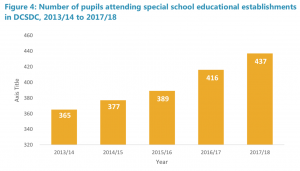 In 2016/17 there were 2,045 school leavers. The percentage of school leavers who achieved at least 5 GCSE’s grades A*-C (or equivalent) was higher for DCSDC compared with NI in 2012/13 and 2014/15 but lower in 2013/14, 2015/16 and 2016/17. 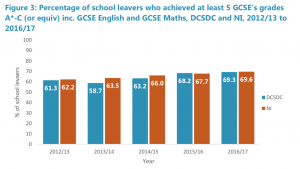 The percentage of school leavers, achieving at least 5 GCSE’s grades A*-C (or equivalent) including English and Maths, was lower for DCSDC compared with NI in 2012/13, 2013/14, 2014/15. DCSDC had a slightly higher proportion in 2015/16 and remained similar in 2016/17. 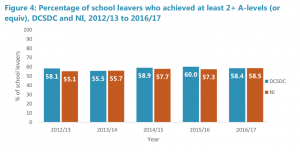 The percentage of school leavers, achieving 2+ A Levels, was higher for DCSDC compared with NI in 2012/13, 2014/15 and 2015/16, was similar in 2013/14 and 2016/17. The percentage of residents aged 16-64 with no qualifications was higher in DCSDC (27.6%) compared with a rate of 21.3% in NI. 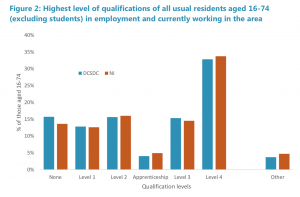 Excluding those with no qualifications, the level of educational attainment in DCSDC was generally similar to that of NI as a whole except for the proportion of the DCSDC population who had attained a ‘Level 4’ qualification. Within DCSDC, this rate stood at 21.9% compared with a rate of 25.8% for NI. The percentage of residents aged 16-74 (excluding students) in employment and currently working in the area, with no qualifications, was higher in DCSDC (15.7%) compared with 13.6% in NI. However, the differential was smaller than that experienced for the working age population as a whole. 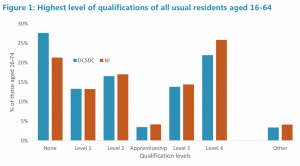 The educational profile for those working in DCSDC compared to those working in NI was very similar in its composition, ranging from those with no qualifications up to the highest level of qualification attained (Level 4).